KEEP CALM AND CARRY ON: HUGE things today. HUGE. This week I enjoyed watching all our leaves here change colors and it reminded me just how much I love the fall. I have a few short things today to share because I'm super busy getting ready for Billy's best friends wedding in Cleveland. What do you think of my new design?! Thanks so much Meg! #2. I'm guest posting today over at one of my favorite blogs - Kelly @ Eat Yourself Skinny Make sure to explore all of Kelly's wonderful skinny recipes. Girl knows what she is talkin' about! #3. Ya'll must go buy this Sally Hansen 'Mega Shine' top coat. right now. I originally spotted it on C Mae's blog and decided to give it a try. It is AMAZING. This top coat dries in 60 seconds and makes your nails look like they were professionally done...and super shiny. Love it and definitely recommend it. What are you weekend plans?! 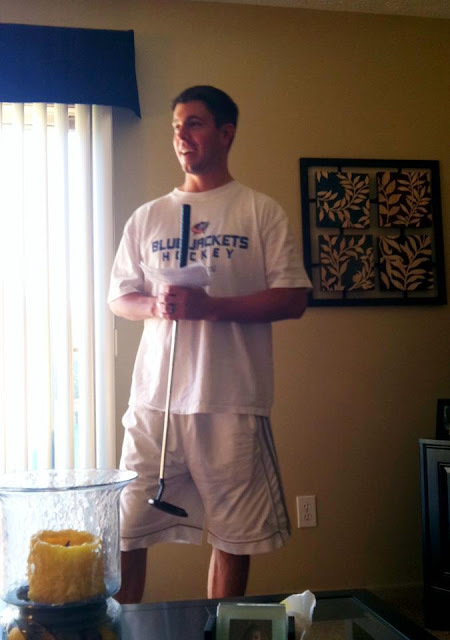 ...it's completely normal to use a golf club as a microphone, right? oh, and guess who's at the office with me today? LOVE the new design!!! She did a fantastic job!! Haha I LOVE that he's using the golf club as his mic :) I must get some of that topcoat too. The shininess (is that a word?) is always my fav part of a salon mani or pedi! Love the new design! Have fun at the wedding! Love your new design! It is super cute!! Love that he is using a golf club haha! Your new design is so cute! :) I hope you have a great time at the wedding! That is so funny about the speech. My husbands best man was so nervous! Thats too funny that Billy is using a golf club as a mic! When is your wedding, Saturady!? we need to meet up like seriously ... soon ... please!? LOVE the new blog design! It is perfect and so you! HOLY CUTENESS! Your new layout is SOOOO you!!! LOVE It! Isn't Meg a flippin' genius??!! LOVE Kelly @ Eat Yourself Skinny...she's totally my kinda girl! Billy & the golf club...hysterical. And yes...for a guy...that's completely normal. Love the new design :) and the golf club mic!! I mean you gotta do what you gotta do, right? ha love it! I went out and bought that Sally Hansen polish after reading another blog too and I love it!! Ahhhh! It's perfect! I've already updated your button on my blog, that's how much I love it :) Oh, and the picture of you on the side is just gorgeous! Hope you have a lovely weekend in Cleveland!! ITS SOOOOOOOOO CUTE!!!! I absolutely love it! I wish Bailey could come to work with me! Haha I love that he was practicing with a golf club. Resourceful if you ask me! Have SO much fun at the wedding this weekend! I love the new layout!! Have a great time this weekend!! Love the new design very cute lady!! Have fun in Cleveland!!! We will miss you at The Goat this Saturday!! Love the new design! I am new to the blog world, but I did see your old one too! The golf club is pretty funny! I needed a good smile this morning! pretty. i love the new look. have fun at the weekend! i'm laying low and soooo excited about it. Aww, I totally wish I could take our little man to work! I love the new design; I really need to give mine an update! Hope you have a great weekend! Hey I commented YESTERDAY on the new layout!!! Thanks for the shout out bout the nail stuff! love love LOVE your new design! I'm a brand new blogger so I didn't see your page before, but the design is to die for now! I am now your newest follower and looking forward to following your future adventures! Katie! I love the new blog design - so freakin' cute!! Hope the weddng was wonderful this weekend! Love, Love, LOVE the new blog design girl!! I loooooove the new design. So cute =) Missed reading your blog over the past week but I am finally getting caught up on all that I missed out on! !